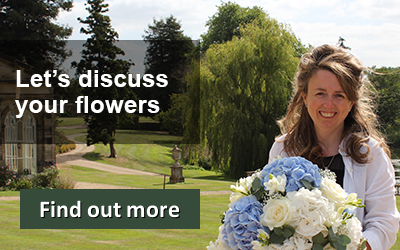 From the first time I met Jenni to discuss her wedding flowers she had a very clear idea of the flowers and colour scheme she wanted. Jenni initially contacted us over a year before her wedding, as she was keen to make her arrangements and get her supplies booked. 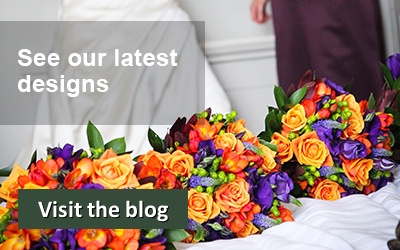 At that first consultation Jenni decided that she wanted to have purple wedding flowers to coordinate with the colours of the bridesmaids dresses. 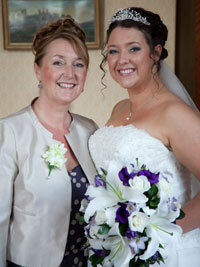 One of Jenni’s favourite flowers is the white oriental lily that you can see featuring in her bridal shower bouquet. 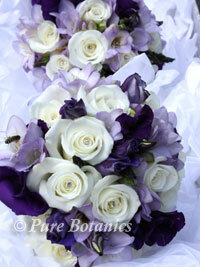 We then discussed other flowers that had a purple and lilac colour theme to link through to the bridesmaids’ dresses. 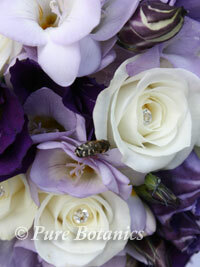 In her bouquet you can see how I added purple lisianthus and lilac freesias as the colour accent. These worked really well with the white lilies. For the bridesmaids’ bouquets I then combined white roses with the purple wedding flowers to produce three handitied posy bouquets that you can see in the photo above right. 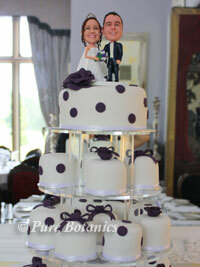 I just managed to get a photo of them before I delivered them up to Jenni’s suite at Wroxall Abbey. 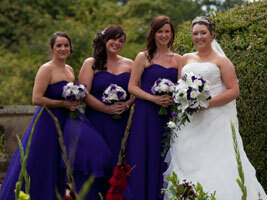 You can see that combining white with the purple flowers in the bridesmaid’s bouquets makes them stand out in front of the deep colour of the dresses. Jenni wanted to fill Wren’s Cathedral full of lilies but unfortunately her dad and one of her bridesmaids suffer from hay fever and the fragrance and pollen from such a strong flowers would not have been good for them. 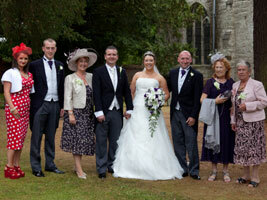 So we continued the theme of white roses tied with purple ribbons for the pew ends. 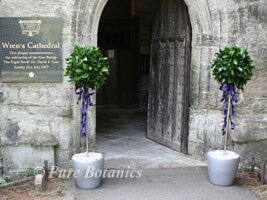 Outside at the entrance to Wren’s Cathedral I placed two bay trees decorated with floating purple satin ribbons. Bay trees and flower trees work really well at the entrance here as you have such a nice path leading up to this church and the trees mark the entrance really well. 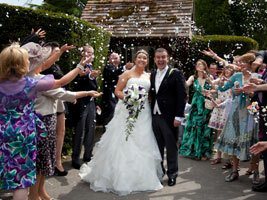 I just love this photo that Jenni sent through of her and Rob leaving the church in a shower of confetti. I really appreciate it when people are kind enough to send us through some of their wedding photographs as it’s so lovely to see the flowers with the people you have made them for and I think Jenni’s shower bouquet looked wonderful. 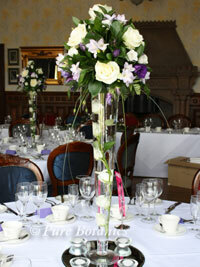 We continued with the purple wedding flower theme to the wedding breakfast in the Mansion at Wroxall Abbey. Here you can see the table arrangements (photo below right) that Jenni chose. 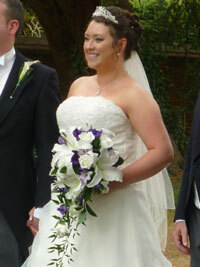 These tall wedding centrepieces featured white roses, purple lisianthus and lilac freesias as we used in the bouquets. White submerged roses were placed inside the vases to add extra interest. I have to say that these wedding centrepieces are one of our most popular designs. They are really tall on the table and therefore don’t block the view or get in the way of the conversation across the table. I couldn’t help but take a photo of the couple’s wedding cake, as I loved the personalised topper and tower of cute mini wedding cakes. 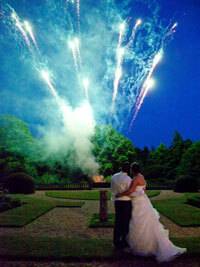 Weddings are all about special moments and these two photos below capture two very special intimate moments perfectly. For me weddings are all about individual taste and I just love meeting people to discuss and design their own special wedding flowers and I really enjoyed creating these beautiful purple wedding flowers for Jenni and Rob’s Wedding in July. 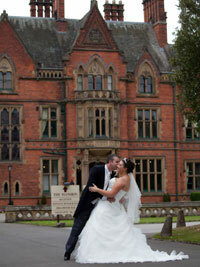 See more of our wedding flowers at Wroxall Abbey.